On April 5, 1941 - a typical, cool spring San Francisco day - dignitaries and guests gathered on an empty plot of land along Parnassus Avenue for a momentous occasion. The crowd, which included politicians, physicians, press, and curious members of the general public, was assembled to witness the laying of the cornerstone of California's first modern neuropsychiatric institute. At 2:30 p.m., Governor Culbert L. Olson began the ceremony by remarking, "We are here to lay the cornerstone of a building which is important enough just because of its size and cost, but which is of transcendent importance because of what it means to the science of medicine, because of what it means to government, in general, and our state government in particular, and above all because of what it means to the people." As Olson, joined by UC Medical School Dean Emeritus Robert Langley Porter, MD, and UC President Robert G. Sproul, spread cement with a trowel and placed the time capsule cornerstone, he noted, "My use of this trowel is symbolical. With it, I spread the cement of the brotherly love which tempers our common purpose, the improvement of man's lot; that cement which binds us together in human brotherhood." And thus, the physical foundation of what would be officially named later that afternoon as the Langley Porter Clinic was set in stone. The ceremony officially marked the beginning of construction of the first modern state psychiatric hospital in the Bay Area, but it also signified the end of a long and sometimes tortuous process which involved decades of false starts, meticulous negotiations between state agencies, and the outbreak of two world wars. The California State Legislature first passed a bill in 1913 authorizing the construction of a psychiatric research and clinical institution in the Bay Area, but Governor Hiram Johnson didn't sign the law because it lacked funding. Proposals were made once again in early 1917 to introduce legislation appropriating up to $500,000 for construction costs, but the United States' entry into World War I in April of that year brought legislative consideration of the matter to a sudden halt. Throughout the 1930's, UC Medical School Dean and professor of pediatrics Robert Langley Porter, MD, became a vocal advocate for the construction of a neuropsychiatric institute on the San Francisco campus. In 1937, he contacted UC President Robert Sproul to inform him that the state's Department of Institutions (today known as the California Department of State Hospitals) had $5 million in funding available for the construction of two psychiatric diagnostic units - one each in Northern and Southern California. The two quickly formed a plan for the university to lease, donate, or sell land previously purchased for the College of Dentistry to the state in return for the building of a psychiatric hospital on it. Their ambitious plan called for a 250-bed facility which would act as the first line of diagnosis and treatment for all mental health patients in Northern California. Patients who could not be treated quickly at the new site would be referred to other mental hospitals operated by the Department of Institutions. The hospital would also be used for research on psychiatry, neurology, neuropathology, neurosurgery, psychology, and sociology of the mentally ill. Governor Frank Merriam opposed the plan, not wanting the proposed psychiatric hospital under the university's direct control. He did agree, however, to provide funding for the unit if it existed as a state hospital independent of university control under the oversight of the Department of Institutions. Accordingly, plans for the clinic were modified to shift it from a diagnostic unit to a 100-bed clinical/educational facility for training professionals who would work in the Department of Institutions' various psychiatric hospitals. By the end of 1939, the university and the state had an agreement in principle for UC to donate land for the hospital in exchange for $600,000 in funding for its construction. Unwilling to wait for the legislative process to play out, construction began on the hospital in early 1941. 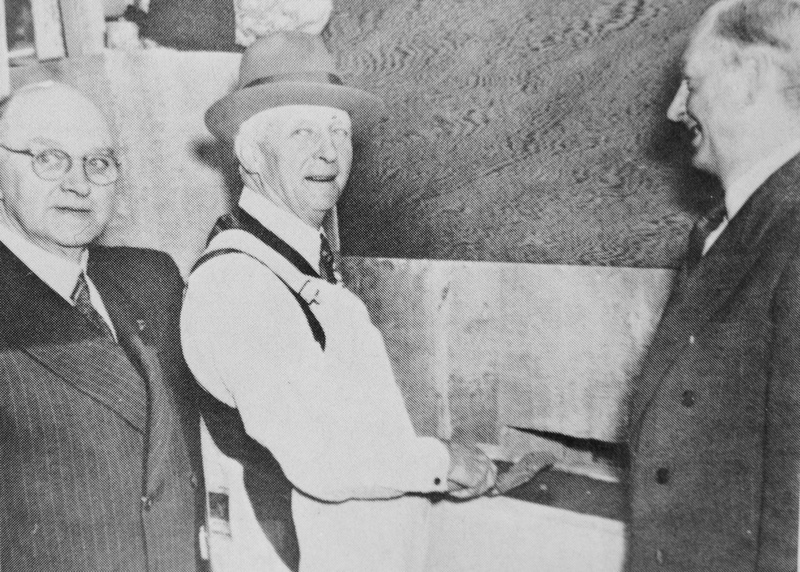 The legislature formally reviewed the plan and incorporated it into Senate Bill 650, which was signed by Governor Olson on July 12, 1941 (three months after the laying of the cornerstone). Gathering support for approval of the facility's construction was no small feat, given the focus on mobilization efforts in a nation preparing for what seemed to be an inevitable entry into a second World War. Unlike 24 years earlier when the advent of World War I stopped momentum for the hospital, however, state officials remained committed to its establishment. 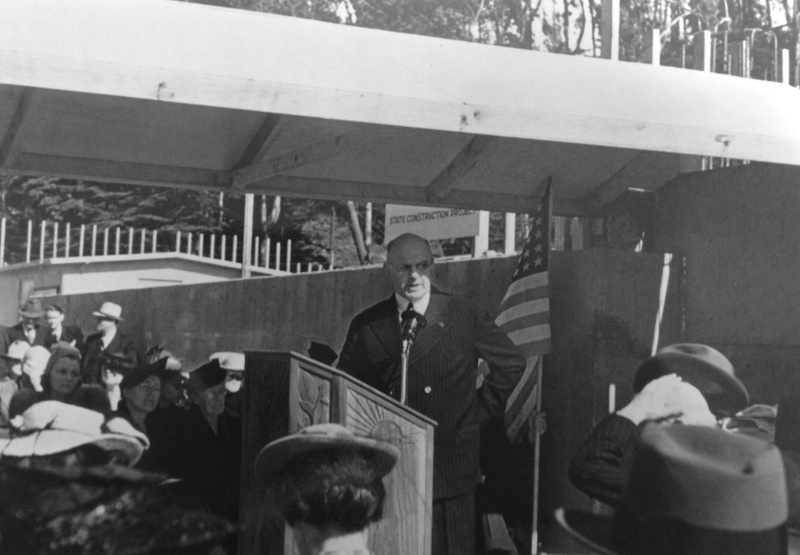 "It would seem strange, not to say unseemly, if I failed to make mention of the fact that we are launching this undertaking in the midst of a world at war," noted Governor Olson during the cornerstone ceremony. "Let me observe therefore that this clinic is a place for the pursuit of science, and an example of its application to the most humanitarian of objectives: the saving of human minds and lives... It is peculiarly a project in pursuit of peace." Construction of the hospital continued unabated following America's entry into the war later that year. The Langley Porter Clinic began seeing its first patients in late 1942 under inaugural director Karl M. Bowman, MD, and was formally dedicated on February 13, 1943. During the festivities, Governor Olson officially named the hospital in honor of Porter. "We name this hospital the Langley Porter Clinic because Dr. Langley Porter was for many years, ending only a short while ago, the dean of this great medical school...," said Governor Olson. "For a long time, Dr. Porter saw the need and advanced the construction of a hospital such as this, in close proximity to the Medical School. His social-minded interest, his determined advocacy, served to promote public recognition of the very practical results that we have every right to expect from the healing services to be rendered, the learning to be gained, and the richly fruitful research to be conducted in this, the Langley Porter Clinic." For Porter, the clinic's construction marked the end of a long quest to advance psychiatric research and clinical services at the university. "One of the most fundamental advances that medicine has made in recent years is the recognition that soul and body are not divided, are not two entities," he told the crowd during the ceremony in 1941. "Long ago, it became evident to those responsible for the conduct of the Medical School and of the University Hospital that progress in our power to deal with mental diseases was all too slow... With the erection of this psychiatric hospital, a dream of better things has come to pass." Over the following 75 years, the name of the facility has changed several times - first to the Langley Porter Neuropsychiatric Institute, then the Langley Porter Psychiatric Institute, and finally the Langley Porter Psychiatric Hospital & Clinics - and innumerable noted clinicians, researchers, and educators have walked through its halls, both as guests and as faculty. In 1973, the hospital was formally transferred to the control of the University of California and merged with UCSF's academic Department of Psychiatry, allowing Porter's "dream of better things" to pass beyond the facility's walls throughout the city of San Francisco and across the Bay Area. The UCSF Department of Psychiatry and the Langley Porter Psychiatric Institute are among the nation's foremost resources in the fields of child, adolescent, adult and geriatric mental health. Together they constitute one of the largest departments in the UCSF School of Medicine, with a mission focused on research (basic, translational, clinical), teaching, patient care, and public service. UCSF Psychiatry has an organizational structure that crosses all major UCSF sites - Parnassus, Mission Bay, Laurel Heights, Mt. Zion, Zuckerberg San Francisco General Hospital and Trauma Center, the San Francisco VA Health Care System, and UCSF Fresno.